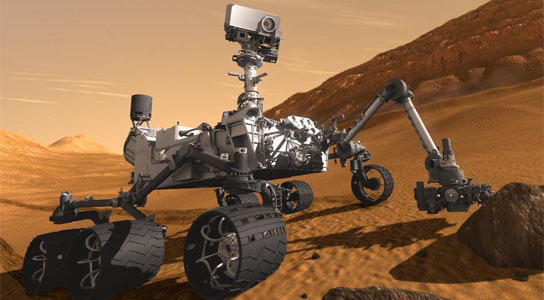 In this artist's picture, the rover examines a rock on Mars with a set of tools at the end of the rover's arm, which extends about 2 meters (7 feet). Two instruments on the arm can study rocks up close. Also, a drill can collect sample material from inside of rocks and a scoop can pick up samples of soil. The arm can sieve the samples and deliver fine powder to instruments inside the rover for thorough analysis. Engineers have discovered and corrected the computer reset that occurred two months ago on NASA’s Mars Science Laboratory. Based on trials conducted on a test computer, the mission team modified the register configuration resulting in a successful software update. PASADENA, California — Engineers have found the root cause of a computer reset that occurred two months ago on NASA’s Mars Science Laboratory and have determined how to correct it. The fix involves changing how certain unused data-holding locations, called registers, are configured in the memory management of the type of computer chip used on the spacecraft. Billions of runs on a test computer with the modified register configuration yielded no repeat of the reset behavior. The mission team made this software change on the spacecraft’s computer last week and confirmed this week that the update is successful. The reset occurred Nov. 29, 2011, three days after launch, during use of the craft’s star scanner. The cause has been identified as a previously unknown design idiosyncrasy in the memory management unit of the Mars Science Laboratory computer processor. In rare sets of circumstances unique to how this mission uses the processor, cache access errors could occur, resulting in instructions not being executed properly. This is what happened on the spacecraft on Nov. 29. “Our target is in view,” said JPL’s Steve Collins, attitude control subsystem engineer for Mars Science Laboratory’s cruise from Earth to Mars. The spacecraft’s cruise-stage solar array is producing 704 watts. The telecommunications rates are 1 kilobit per second for uplink and 800 bits per second for downlink. The spacecraft is spinning at 1.97 rotations per minute. Be the first to comment on "Engineers Resolve Mars Science Laboratory Computer Issue"